Happy Sunday! I keep thinking about the words from O Holy Night "a thrill of hope, the weary world rejoices". And Christmas does thrill many of us--the decorations, gifts, special foods, family time. But, for far too many folks, Christmas is a time of disillusionment. We are short on time, short on money, and short on patience--we are anything but hopeful. God knows, he knows we are tired, and lonely, and sad. He knows and he offers us hope. Hope is given to a weary world. Hope is a promise. Hope is the anticipation of something better. Hope is not something we need to work at, it is an unconditional, abundant gift that came to us as a tiny bundle wrapped in swaddling clothes...and that is thrilling. 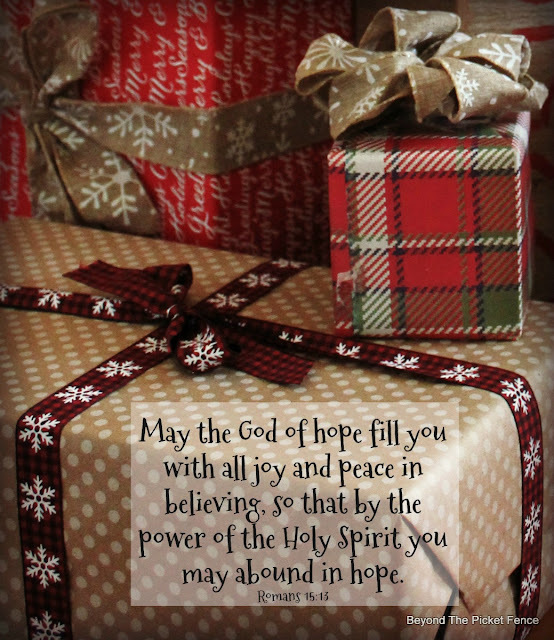 This season, let's rest in and accept and enjoy the gift of God's hope. Hope you are enjoying beautiful winter in MT. I still miss it there, to me there is no place better than MT. Hope not too cold for you and yours and are enjoying wonderful holiday season. Thank you--it is beautiful right now, but cold! !